KEY POINT: Many ‘Conspiracy Theorists’ are actually Conspiracy Realists. The following essay on the “Conspiracy Theory” is perhaps the best ever to appear on the Internet. It clearly delineates the many subtleties and nuances by which the label “Conspiracy Theory” has been used to shut down honest public debate. It also shows how critical thinking on the part of the individual has been discouraged and mocked. The various entities which colluded to conceive the label — “Conspiracy Theorist” — knew exactly what they were doing alright. They have been successful in effectively terminating the traversing trajectories of truth-seekers everywhere … over many decades. However, every actual conspiracy designed to deprive the people of the truth is always exposed sooner or later. That time is now! With the pervasiveness of the Internet throughout societies everywhere, the many once isolated ‘conspiracy theorists’ are now able to collaborate with others of like mind. In this way they are able to share their theses and theories about everything. In this refreshing environment and new climate the official 9/11 Commission Report has been proven to be a complete fabrication foisted by U.S. Federal Government on the American people. So, too, has the JFK assassination been proven to be a classic CIA Execution Plan. By inference the research paper below lays bare a simple fact of life: that the Mainstream Media (MSM) is the single biggest disseminator of the many falsehoods regarding the “Conspiracy Theory”. The MSM has also published countless false conspiracy theories like the utterly ridiculous 9/11 narrative fabricated by the government. In the interest of protecting the system at all costs, anything that departs from the party line is now labeled a ‘conspiracy theory’ by the MSM. At the end of the day, the MSM will be regarded as the most prolific purveyor of false conspiracy theories of all time. Yes, that time is surely upon us as many signs and events point directly to a fast-approaching day of reckoning. Perhaps this campaign season of the 2016 U.S. presidential election will serve as the defining moment when so many truths (sometimes known as real conspiracies) shall be revealed, once and for all. The assassination of the President of the United States on national television by a “lone” assassin, Lee Harvey Oswald, who himself is assassinated the next day by another “lone” assassin—would cause even the most rational skeptic, or critical thinker, to question the institutional narrative of the events. In other words, the institutional narrative, or official explanation, of a lone assassin, who was in turn assassinated the very next day by another lone assassin, is as epistemically dubious, and as equally “silly and without merit,” as any of the conspiracy theories surrounding the JFK assassination. Noam Chomsky, linguist and scholar, contrasts conspiracy theory as, more or less, the opposite of institutional analysis. The latter focuses mostly on explanations based on the information found in official records of publicly known institutions, whereas the former offers explanations based on information derived from coalitions of individuals. 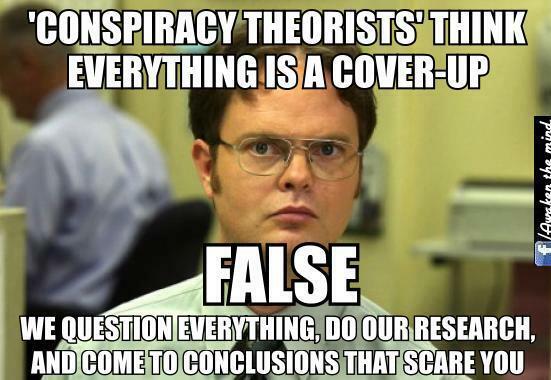 However, on closer examination, academics can see, and are forced to admit, that there is no systemic flaw to the concept of the conspiracy theory per se, because 1) there have been at least 33 Conspiracy Theories That Turned Out To Be True and 2) it is in the nature of many conspiracy theories that they cannot be falsified; that is, proven to be false. In Of Conspiracy Theories, Brian Keeley acknowledges this important point but then argues that it’s not the theory that is the problem, but rather the theorist. The theorists, we are told, display a “particular absence or deformities of critical thinking skills when they refuse to accept the institutional explanation of The Event.” He further wonders whether the problem lies in our teaching methods. Keeley refers to the numerous historically verified conspiracy theories as Warranted Conspiracy Theories (WCTs), as opposed to theories that have not, or cannot, be verified and are thus, according to Keeley, Unwarranted Conspiracy Theories, (UCTs). When all the academic terminology, doublespeak and jargon are stripped away, a UCT is simply an alternative explanation of The Event that hasn’t been verified by independent sources. And the best he can show as to “why the warrant for believing them is so poor” is public trust skepticism. “It is this pervasive skepticism of people and public institutions entailed by some mature conspiracy theories which ultimately provides us with the grounds with which to identify them as unwarranted. At some point, according to Keeley, we shall be forced to recognize the unwarranted nature of the conspiracy if we are to be left with any warranted explanations and beliefs at all. And finally, as the theory grows to include more and more people and institutions and yet remains unverified, the less plausible the conspiracy becomes; because, it stands to reason that, at some point, someone would have come forward with the missing and necessary data. Keeley asserts that, “we do live in an open world, but only because to think otherwise would lead to disastrous skepticism.” For Keeley, the theorists lack critical thinking skills because they don’t recognize that a belief in a UCT invalidates every other social belief they need to function in society. In his attempt to prove the theorists are guilty of too much skepticism, Keeley overlooks the implications of the nature, logistics and institutional narrative of The Event. Everything that can be shown to be true about the mature conspiracy theory—unfalsiabiality, skepticism, epistemically dubious—applies to the narrative of The Event. A close look at the JFK assassination mature conspiracy will illustrate my point. Is the institutional narrative of the Oswald lone assassin theory, any more epistemically dubious, or any less “silly and without merit,” as the JFK tin-foil hat conspiracies? The CIA killed JFK; the Mob killed JFK; the CIA and the Mob working together killed JFK; last but not least, Fidel Castro contracted with the KGB to have JFK killed. Neither the institutional nor the conspiratorial explanation of the event is a warranted belief and should be dismissed on epistemic grounds. That is, there is sufficient reason to believe that the institutional view, just like the conspiratorial view, of the JFK assassination is false, yet neither view can be falsified. No discussion of conspiracy theories would be complete without a discussion of errant data. Anomalies and discrepancies surface immediately upon the announcement of The Event and increase as the conspiracy matures. Errant data, or data that cannot be reconciled with the official explanation of the event, is the chief tool of the conspiracy theorist. Again, the JFK Assassination illustrates my point. The rational community ignores the details of the rifle, the bullet and the witnesses who heard other shots from other directions (errant data) on the grounds that there is no reliable way to gather social data, as opposed to scientific, data about the human world. Furthermore, when pressed, people will be ready to admit that the anomalies and inconsistencies (errant data) in the institutional view could never be chance occurrences. They escape the obvious improbability question by correctly pointing out that the errant data, even if true, does not constitute proof of anything, especially that the event was a conspiracy. Related to errant data is what we shall refer to as the Conspiracy Theory Paradox. Why would the conspirators, with the ability to plan and manage a conspiracy involving the CIA, FBI, Secret Service, Police Departments and Coroners offices in two cities (e.g., the JFK assassination), come up with such a convoluted senseless plan riddled with so many mistakes, anomalies and discrepancies (errant data)? And then, inexplicably, that same errant data is ubiquitously exposed in the media for everyone to question. Neither the rational nor the conspiracy community have an explanation for why the conspirators would come up with such a convoluted senseless plan when a much simpler plan would accomplish the same goal. Why not have a rogue agent, in the CIA, FBI or Secret Service shoot the president in the middle of the night? Neither the rational nor the conspiracy community have an explanation for why the conspirators would allow the mistakes, anomalies, discrepancies and the holes in the “official story” (errant data) to find it’s way into the official institutional record and then allow that same data to be aired on national television for all to question. Neither the rational nor the conspiracy community have an explanation for how trivial it would have been for the conspirators to change or falsify the alleged discrepancy or anomaly and avoid the stupid “mistakes.” Consider how easy it would for the master criminals to just keep the Errant Data from being aired on national television compared to the magnitude of the criminal acts they are alleged to have committed. Although the existence of a Paradox or Errant Data could never be offered as proof that the Event was a conspiracy, they are none the less consistent, though not proof, with a conspiracy to make you believe the event was a conspiracy. Unwilling to abandon what they know to be the truth; that is, that the institutional view is false, theorists are forced into a degenerative research program. A degenerative research program is one where the auxiliary hypotheses and initial conditions are continually modified in light of new evidence in order to protect the original theory from apparent disconfirmation. The majority of people exposed to “The Event classified as a UCT,” are apathetic, indifferent and feel powerless because of a belief that the power elite control the world. The rational community, or anyone who is not a theorists or indifferent, consciously or unconsciously realizes the institutional view cannot be true; but at the same time, again consciously or unconsciously, realize that any alternate explanation or theory would require they question the very foundations of their beliefs about the society they live in. When the rational community resort to ad hominem attacks, i.e., conspiracy theories are “silly, without merit” or the result of irrational thinking by paranoid schizophrenics, they reveal how large a role trust—in both institutions and individuals, mechanisms and people —plays in their thinking and beliefs about UCTs. What can we say about the institutional narrative, the Conspiracy Theory Paradox and the Errant Data? The Theorists are really only guilty of not recognizing the institutional narrative, the Conspiracy Theory Paradox and the Errant Data are consistent with, but not necessarily proof, of a Conspiracy to make you believe the event was a Conspiracy. Is there any justification for a belief that the Warren Commission properly investigated the assassination of JFK when they concluded Oswald acted alone when he used a heavily oiled cheap rifle with a distorted sight, hidden in a paper sack later discovered on the sixth floor without a trace of oil, for his miraculous feat of marksmanship with extraordinary accuracy at a moving target in minimal time? The Warren Commission reported that a single bullet hit Kennedy in the back of the neck and exited from the throat just below the Adam’s apple, and that same bullet entered Gov John B. Connally’s back, exited from his chest, went completely through his right wrist, and lodged in his left thigh. Stephen Jay Gould, the Evolutionary Theorist at Harvard University considers conspiracy theorizing “garbage” and believes they must be “discredited [/debunked] in order for society to lead “a safe and sane life.” Gould believes we are vulnerable “thinking reeds,” as opposed to rational creatures, and that unless “we rigorously use human reason, we will lose out to frightening forces of irrationality, romanticism, uncompromising “true” belief which will result in the inevitability of mob action. A UCT is an explanation that runs counter to some received, official, or “obvious” account’ (116-7). In many instances there exists the presence of a “cover story” that is perceived as the most damning piece of evidence for the given historical event under consideration. UCTs typically seek to tie together seemingly unrelated events and because Conspiracy Theorists rarely if ever have a coherent beginning-to-end narrative of what they think happened, many of their theories wind up laying the blame on some other force; e.g., the Illuminati. ‘The chief tool of the Conspiracy Theorist is errant data, or anomalies and discrepancies in information. Keeley defines errant data as data that cannot be reconciled with the official explanation of the event; or data, which true, would tend to contradict official explanations and support the cover story. The Fundamental Attribution Error. Conspiracy Theorists have a tendency to focus on errant data and are prone to making what Keeley refers to as the “fundamental attribution error.” The “fundamental attribution error” is the idea that all UCTs can be reduced to a supposed discrepancy or anomaly in one official record or another. The Degenerative Research Program. Conspiracy Theorists exhibit irrational behavior when their theories take on the appearance of forming the core of a degenerative research program. Dispositional versus Situational. Conspiracy Theorists severely overestimate the importance of dispositional factors while underestimating the importance of situational factors when attempting to explain the Conspiracy event. Errant data is only errant in relation to an accepted theory, and to discount errant data on grounds that apply to both errant and non-errant data would be to prejudice oneself in favor of data simply because it happens to be explained by the received theory. At bottom what we face here is what we might term Goodenough’s Paradox of Conspiracies: the larger or more powerful an alleged conspiracy, the less need they have for conspiring. A sufficiently large collection of members of the American political, intelligence and military establishment—the kind of conspiracy being alleged by Oliver Stone et al.—wouldn’t need to engage in such nefarious activity since they would have the kind of organisation, influence, access to information, etc. that could enable them to achieve their goal efficiently and legally. Note the existence of the paradox while it favors the Rational community is not proof the institutional view is correct. The fact that Theorists have no rational explanation of why the conspirators would make so many stupid mistakes reminds me of one of the central arguments of why nature does not imply design. Evolutionists dismiss the design (Intelligent Design) argument for nature because they question the design of the human eye. For example the JFK Assassination. The rational community will knowingly ignore the details of the rifle, the bullet and the witnesses who heard other shots from other directions [errant data] and point out that while a Conspiracy Theory has epistemic value and does provide a unifying explanation of the event and the errant data, there is no reliable way to gather social data, as opposed to scientific, data about the human world. Furthermore, they will admit that the anomalies and inconsistencies [errant data] in the Institutional view could never be chance occurrences but at the same time they correctly point out the errant data does not constitute proof of anything, especially that the event was a conspiracy. Is there any doubt that “there is a conspiracy to make you believe in a conspiracy”? In 1978 the House Select Committee on Assassinations concluded in a preliminary report that Kennedy was “probably assassinated as a result of a conspiracy” that may have involved multiple shooters and organized crime. A progressive research program is where “novel predictions and retrodictions are verified. What I have demonstrated is that there is no justification for a belief in either the Institutional view or the Conspiratorial View of a UCT. Critical thinking skills on the part of the Theorists force them into a degenerative research program. Critical thinking skills on the part of the Rational Community are used to avoid a degenerative research program. “There Are No Conspiracies” by G. William Domhoff in 2005 looks at Conspiracy Theories and the Power Elite from a social science perspective. [as opposed to the philosophical] G. William Domhoff, a Research Professor at the University of California, Santa Cruz first coined the non-conspiracy acronym TPTB. He received his Ph.D. at the University of Miami and has been teaching at the University of California, Santa Cruz, since 1965. Four of his books are among the top 50 best sellers in sociology on the Power Elite Theory for the years 1950 to 1995: Who Rules America? (1967); The Higher Circles (1970); Who Rules America Now? (1983); and the non-“conspiracy” critique and theory of the U.S. power structure, The Powers That Be (TPTB) in 1979. The Power Elite theory, despite a superficial resemblance to some right-wing conspiracy theories, has key differences from them. The latter take, as the primary motive force of history, that “America is ruled from behind the scenes by a select conspiratorial group with secret desires united around some esoteric or gratuitously evil ideology. And while the concentration of political and economic power [in the control of small, interlocking elites], is indeed likely to result in sporadic conspiracies; such a conspiracy is not necessary to the working of the system–it 1) simply occurs as a secondary phenomenon, and 2) occasionally speeds up or intensifies processes that happen for the most part automatically. The Transparent Conspiracy is a collection of essays by Michael Morrisey. Morrisey, who holds a Ph.D. in linguistics from Cornell University, expands on the idea that the leaders (conspirators) “failed on purpose” and coined the phrase the “Mass Psychology of Partial Disclosure.” Morrisey makes a compelling argument that there exists a conspiracy that involves the controlled media disclosing a limited amount of information concerning the government’s culpability in atrocities such as the JFK, MLK and RFK assassinations. Morrisey believes a shadow government orchestrates a well-managed conspiracy/cover-up in order to intimidate, demoralize and alienate the tuned-in segment of the population that fully comprehends the corrupt nature of our government institutions. The government’s purpose, according to Morrisey, is to keep the masses in a state of helplessness so they will be unable to upset the not-so-secret plans for what is referred to as for a New World Order. While his arguments are persuasive revisionist History contradicts any justification that the masses need to be kept in a state of helplessness. All of the Revolutions have shown to be the product of the elite and not the popular uprisings we were let to believe in our filtered history books. World-renowned author, investigator and philosopher, Paris Flammonde, has also completed a major work, “The Assassination of America,” a rebuttal to the lies and disinformation of the Warren Commission Report and the House Select Committee Investigation on Political Assassinations conducted during the Carter Administration.